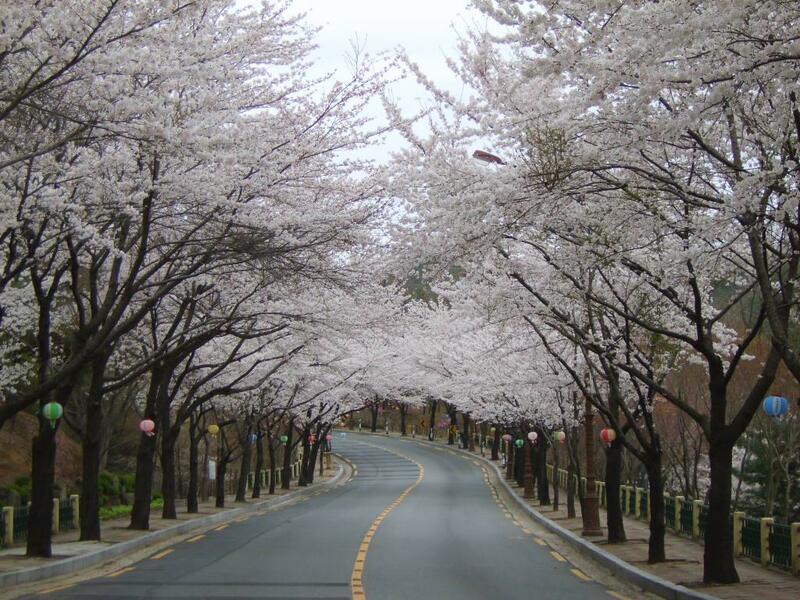 Palgongsan Mountain is a famous mountain in Daegu reaching heights of 1,192 meters. It was called with many different names during the Silla period including Buaksan Mountain, Jungaksan <span style="display: inline !important; float: none; background-color: transparent; color: rgb(0, 0, 0); font-family: 돋움,Dotum,Helvetica,Sans-serif; font-size: 12px; font-style: normal; font-variant: normal; font-weight: 400; letter-spacing: normal; line-height: 18px; orphans: 2; text-align: left; text-decoration: none; text-indent: 0px; text-transform: none; -webkit-text-stroke-width: 0px; white-space: normal; word-spacing: 0px; word-wrap: break-word;">Mountain</span>, Gonsan <span style="display: inline !important; float: none; background-color: transparent; color: rgb(0, 0, 0); font-family: 돋움,Dotum,Helvetica,Sans-serif; font-size: 12px; font-style: normal; font-variant: normal; font-weight: 400; letter-spacing: normal; line-height: 18px; orphans: 2; text-align: left; text-decoration: none; text-indent: 0px; text-transform: none; -webkit-text-stroke-width: 0px; white-space: normal; word-spacing: 0px; word-wrap: break-word;">Mountain</span>, and Dongsusan<span style="display: inline !important; float: none; background-color: transparent; color: rgb(0, 0, 0); font-family: 돋움,Dotum,Helvetica,Sans-serif; font-size: 12px; font-style: normal; font-variant: normal; font-weight: 400; letter-spacing: normal; line-height: 18px; orphans: 2; text-align: left; text-decoration: none; text-indent: 0px; text-transform: none; -webkit-text-stroke-width: 0px; white-space: normal; word-spacing: 0px; word-wrap: break-word;"> Mountain</span>. 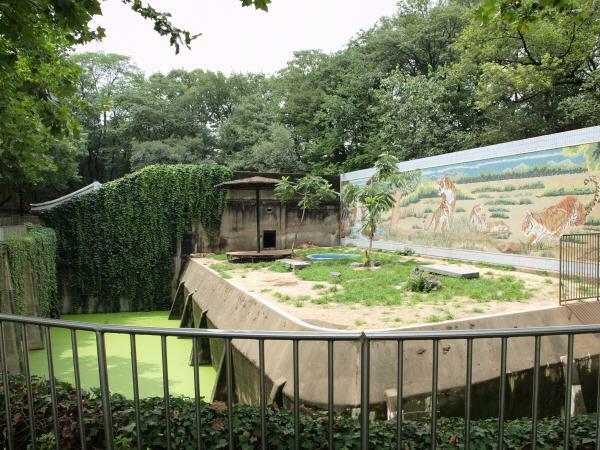 It was called Gongsan during the Goryeo period, and was officially named Palgongsan<span style="display: inline !important; float: none; background-color: transparent; color: rgb(0, 0, 0); font-family: 돋움,Dotum,Helvetica,Sans-serif; font-size: 12px; font-style: normal; font-variant: normal; font-weight: 400; letter-spacing: normal; line-height: 18px; orphans: 2; text-align: left; text-decoration: none; text-indent: 0px; text-transform: none; -webkit-text-stroke-width: 0px; white-space: normal; word-spacing: 0px; word-wrap: break-word;"> Mountain </span>during the Joseon period.<br><br type=_moz>Tourism course - It’s the famous mountain (also the efficacious mountain) popular with both of Daegu citizens and visitors from other areas. 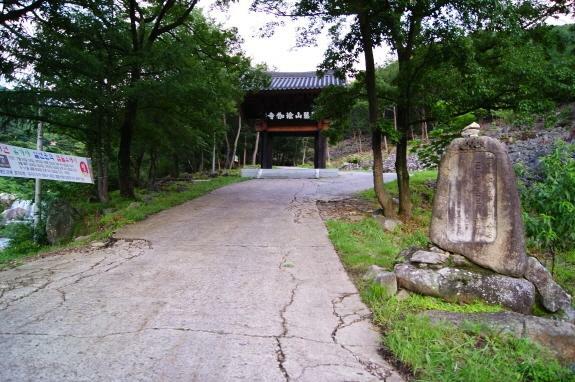 The road from Donghwasa Temple till Grotto of Amitabha Buddha Triad, Gunwi is the popular path with the car driving visitors. 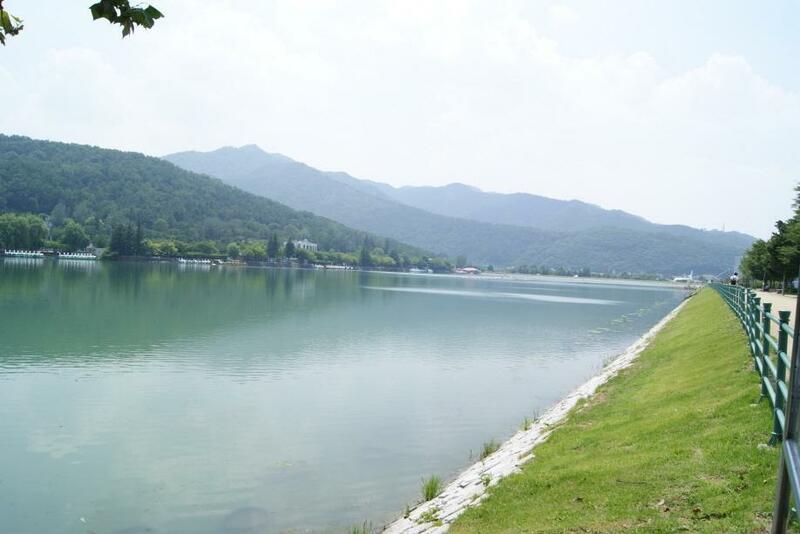 You are suggested to follow the comfortable driving course from Donghwasa Temple, passing by Sutae-gol, Pagyesa Temple and reaching the 3-fork of Guryongsa Temple. 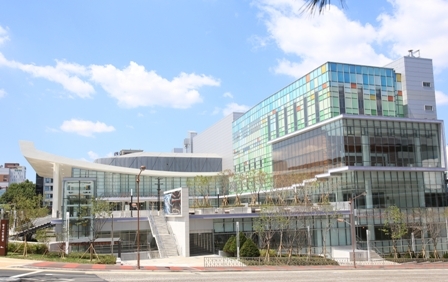 There are other courses towards Gunwi Samjon Grottoes, Gasan Sanseong and Songlimsa Temple. 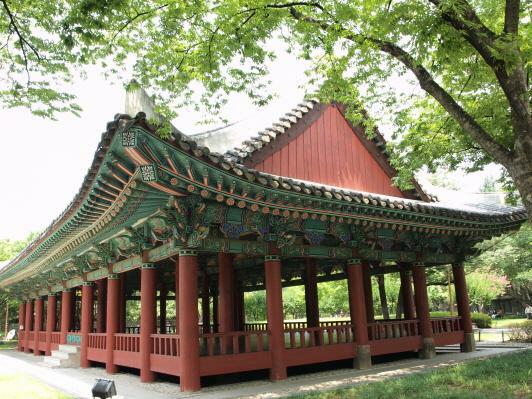 It’s also a famous Buddhism cultural center with various scattered temples in the mountain, like Gatbawi, Donghwasa Temple, Pagyesa Temple,Buinsa Temple, BukJijangsa Temple, Gwaneumsa Temple and Gwan-am. There are mountains of rocks and streams here, where you can appreciate the azaleas covering the whole mountain in spring, frondent jungle and limpid stream sound spreading around the mountain in summer, the amazing maple leaves overspreading the ring road in autumn, forming an amazing scenery line. 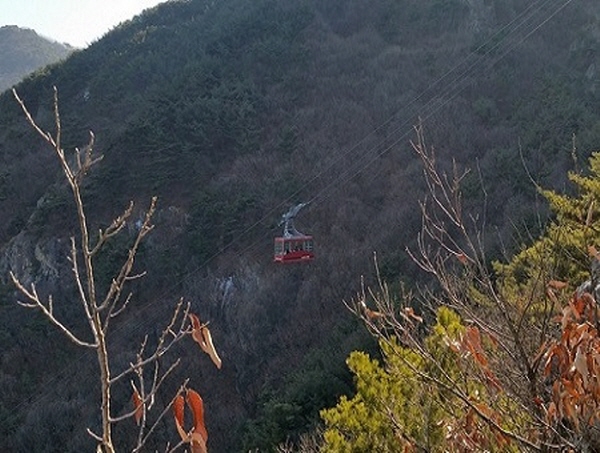 Apsan Cable car is located in Keungol Jarak-gil(road) near War Memorial Museum of the Nakdonggang River Battle inside Apsan Park, Daegu. 48 people can get on the cable cars and it takes about 5 minutes one way at a speed of 3.5 meters a second. The cable car fare is 7,000 won for one way and 9,000 won for a round trip for a person and 6,500 won for one way and 8,500 won for a round trip for a group. Child gets a 2,000 won discount. 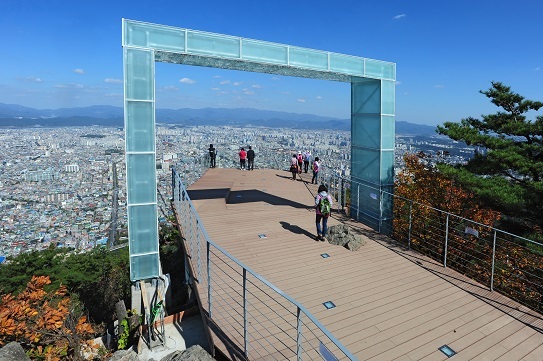 People are able to be moved deeply when they get to the top of the mountain taking cable cars and then look out picturesque scenery of Daegu before their eyes. People can relieve their stress and be rejuvenated by taking breaths of fresh air as much as they want in the dense forests.